July 17, 1674, Southampton, England. November 25, 1748, Stoke Newington, London, England. 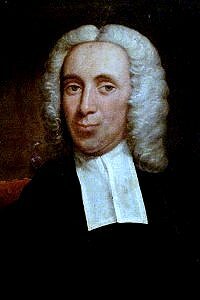 Isaac Watts, D.D., pastor of a Church of Christ in London, successor to the Rev. Joseph Carlyl, Dr. John Owen, Mr. David Clarkson, and Dr. Isaac Chauncey, after fifty years of feeble labours in the Gospel, interrupted by four years of tiresome sickness, was at last dismissed to his rest. Inuno Iesu omnia. 2 Cor. v. 8 Absent from the body, and present with the Lord. Col. iii 4. When Christ, who is my life, shall appear, then shall I also appear with him in glory. This monument, on which the above modest inscription is placed, by order of the deceased, was erected as a small testimony of regard to his memory, by Sir John Hartopp and Dame Mary Abney. Watts’ father was a Non­con­form­ist imprisoned twice for his religious views. Isaac learned Greek, La­tin, and He­brew under Mr. Pin­horn, Rector of All Saints, and head­mas­ter of the Grammar School in South­amp­ton. Isaac’s taste for verse showed itself in early childhood, and his promise caused a local doctor and other friends to offer him a university education, assuming he would be ordained in the Church of England. 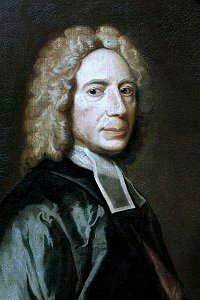 However, Isaac declined and instead entered a Non­con­form­ist Academy at Stoke New­ing­ton in 1690, under the care of Thomas Rowe, pastor of the Independent congregation at Gird­lers’ Hall; Isaac joined this congregation in 1693. Watts left the Academy at age 20 and spent two years at home; it was during this period that he wrote the bulk of his Hymns and Spiritual Songs. They were sung from manuscripts in the South­amp­ton Chapel, and published 1707–09. The next six years of his life were again spent at Stoke New­ing­ton, working as tutor to the son of eminent Pur­i­tan John Har­topp. The intense study of these years is reflected in the theological and philosophical material he subsequently published. Watts preached his first sermon at age 24. 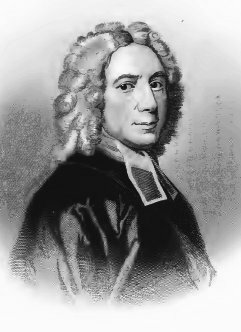 In the next three years, he preached frequently, and in 1702 was ordained as pastor of the Independent congregation in Mark Lane. At that time he moved into the house of a Mr. Hol­lis in the Mi­nor­ies. His health began to fail the next year, and Sam­u­el Price was appointed as his assistant in the ministry. In 1712, a fever shattered his constitution, and Price became co-pastor of the congregation, which had moved to a new chapel in Bu­ry Street. It was at this time that Isaac became the guest of Sir Thom­as Ab­ney. He lived with Ab­ney (and later Ab­ney’s widow) the rest of his life, mainly at The­o­balds in Hert­ford­shire, then for 13 years at Stoke New­ing­ton. Absent from Flesh! O Blissful Thought! And Is This Life Prolonged to Me? And Must This Body Die? Are All the Foes of Sion Fools? Do Flesh and Nature Dread to Die? Do I Believe What Jesus Saith? Do We Not Know That Solemn Word? When Shall the Time, Dear Jesus, When? He Dies! The Heav’nly Lover Dies! How Can I Sink with Such a Prop? How Long, O Lord, Shall I Complain? How Long Shall Death, the Tyrant, Reign? How Meanly Dwells th’Immortal Mind! What Shall We Pay the Eternal Son? How Sad Our State by Nature Is! Is There Ambition in My Heart? It Was a Brave Attempt! Jesus! Dear Name, How Sweet It Sounds! Lord, Hast Thou Cast the Nation Off? Why Did the Gentiles Rage? Must Friends and Kindred Droop and Die? My Drowsy Powers, Why Sleep Ye So? Salvation! O the Joyful Sound! Shall Atheists Dare Insult the Cross? Dost Thou the High and Heavenly One? Will God for Ever Cast Me Off? What Happy Men, or Angels, These? What Shall I Render to My God? What Shall the Dying Sinner Do? When Shall Thy Lovely Face Be Seen? Where Shall the Man Be Found? Who Can Describe the Joys That Rise? Who Dares Attempt th’Eternal Name? Who Has Believed Thy Word? Who Is This Fair One in Distress? Who Shall Ascend Thy Heav’nly Place? Who Shall Inhabit in Thy Hill? Who Shall the Lord’s Elect Condemn? Who Will Arise and Plead My Right? Why Did the Jews Proclaim Their Rage? Why Do the Proud Insult the Poor? Why Do the Wealthy Wicked Boast? Why Do We Mourn Departing Friends? Why Do We Mourn for Dying Friends? Why Doth the Lord Stand Off So Far? Why Doth the Man of Riches Grow? Why Has My God My Soul Forsook? Why Is My Heart So Far from Thee? Why Should I Deprive My Neighbor? Why Should I Join with Those in Play? Why Should I Love My Sport So Well? Why Should I Say, ’Tis Yet Too Soon? Why Should I Vex My Soul? Why Should Our Garments, Made to Hide? Why Should This Earth Delight Us So? Why Should We Start, and Fear to Die? Would You Behold the Works of God?